have many binoculars to choose from. Tracking moving or multiple targets with binoculars can be frustrating when you have to constantly readjust focus. 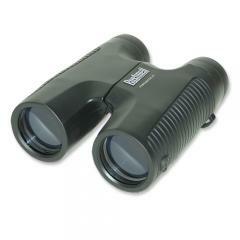 These Bushnell Permafocus 10x42 binoculars eliminate that problem by using a focus-free system that requires no adjustments, making them easy and convenient to use. Their multi-coated optics maximize light transmission to the eye, allowing you to observe in clear, bright, high-resolution detail, and the wide field of view lets you take in a large portion of your surroundings. They come with tough rubber armor that protects against impacts and also provides a secure, non-slip grip.